The Elephant's Trunk nebula is a concentration of interstellar gas and dust within the much larger ionized gas region IC 1396. Located in the constellation Cepheus, this nebula is about 2,400 light years away from Earth. 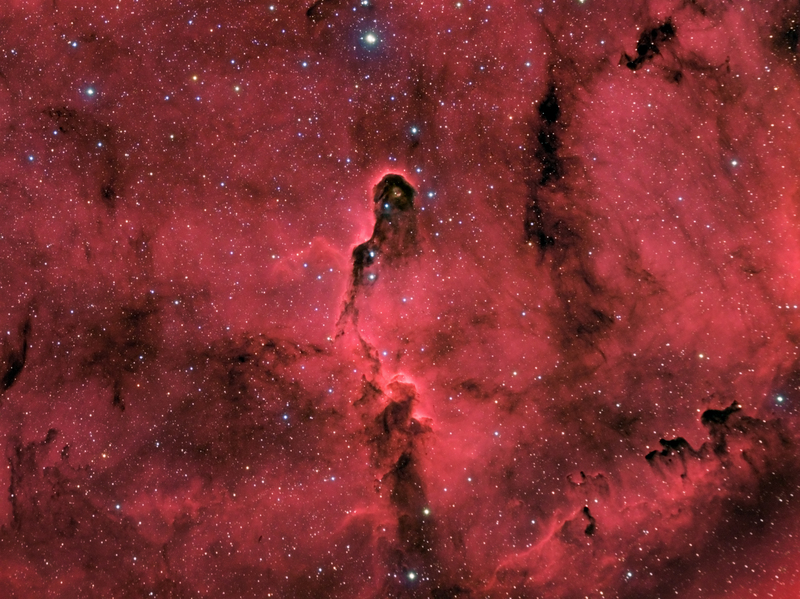 It is commonly called the Elephant's Trunk nebula because of its appearance in visible light wavelengths, where there is a dark patch with a bright, sinuous rim. The bright rim is the surface of the dense cloud that is being illuminated and ionized by a very bright, massive star (HD 206267) that is just to the west of IC 1396A. The entire IC 1396 region is ionized by this massive star, except for the dense globules that can protect themselves from the star's harsh ultraviolet rays. The Elephant's Trunk nebula is now thought to be a site of star formation, containing several very young stars discovered in infrared images in 2003. Two older (but still young by the standards of stars, which live for billions of years) stars are present in a small, circular cavity in the head of the globule. Winds from these young stars may have emptied the cavity.